Sophia Coppola’s wickedly clever The Bling Ring is the film to define what and how “the cult of celebrity” works. It is literally a “how to drink the Kool-Ade” version of the on flow of celebrity worship as the revolving experience of “celebrity status” is passed from hand to hand via enormously expensive trinkets (bling) that bestow glamour (beauty) and celebrity (envy) on all those who touch it. The story arc is based on true events – can anything else be this bizarre? Celebrities like Paris Hilton, Orlando Bloom, Megan Fox, Rachel Bilson and Audrina Partridge post on-line when they are going out. They leave their doors and or windows in their homes open. In the case of Paris Hilton, the keys are under the mat at the front door. Young teen worshipers then go to the houses and take what they want from the closets and cupboards of the absent celebrities. In a beautiful circular completion, they then post themselves on-line with the ill gotten gains. If you had enough time, you could probably follow specific items as they moved through the various on-line displays, bestowing fame and glory on all who touch them. Coppola has made a habit of examining celebrity in her films, and given her pedigree there is no doubt about why the subject interests her. This interest combined with personal history informs her work to such a degree that The Bling Ring subtly becomes far more than the glitzy surface tale it at first appears to be. She wisely makes no judgments, on the celebrities, nor on the kids, just letting all the hidden pieces move in to make up the whole. At the heart of her examination lie the problems of American youths today – vapid, pandering education, on line obsessions, broken homes and drug use. In a telling opening scene, Nicki (Emma Watson) and Sam (Taissa Farmiga) who lives in Nicki’s house because her mother’s slippery slope into drug and alcohol abuse left her homeless, are woken in the morning by the call of Nicki’s mother (Leslie Mann) to come downstairs because its “time for your Adderall.” The kids are medicated at home. It seems too easy to transition to recreational drugs. The Bling Ring is the kids perspective, but just as cameras within cameras are always watching their behaviors, the celebrities they worship and their faux relationship are never far away. Stealing from the celebrities is an act of celebrity they engage in. It’s not seen as a crime, in the same way as, say holding up a 7-eleven is a crime. These kids expect fame. If Paris Hilton can be famous for nothing more than shocking behavior, why can’t I? The kids expect friendship from the celebrities and even in jail, aren’t sure they don’t have it. In a wonderful act of meta narrative, one of the girls ends up in jail with Lindsay Lohan, the person she stole from, who is in there for stealing sunglasses. By this stage even I’m starting to think they’re made for each other. Coppola has the cameras watching the kids all the time. Not only are they taking photos of themselves and filming themselves but Coppola often uses the camera in the same way it is used on celebrities. In an amazing break in scene the camera remains at a distance from the house, watching the kids as they move from room to room, the house itself a giant glass cage. We feel like paparazzi, spying on the robbery, the entire online privacy is compromised by the breaking of a kind of “fourth wall promise” that we all understand no matter what goes on-line, there is a distance between you and I. Security tapes will be used to identify the thieves in a charming twist on the filming theme. When security cameras first appeared as a regular part of our life, we were afraid nothing would be private anymore. Who would have thought the response to this would be to reveal greater intimacy, rather than increasing our desire for privacy. 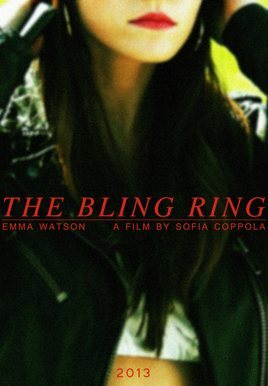 The Bling Ring is a well filmed, fascinating story with fine acting and a great soundtrack. It’s post punk edge and slammed Godard titles give it the edge it needs to bring the viewer closer to the world that they may not normally be seduced by. Coppola makes another great film, but in the end, it is the cult of celebrity itself that shocks and amazes and the story that is what you will take with you when you go.